There are so many different things I love about fall. I love the colors on the trees, the crisp air, picking apples, hayrides. There isn’t a fall activity that I don’t enjoy. 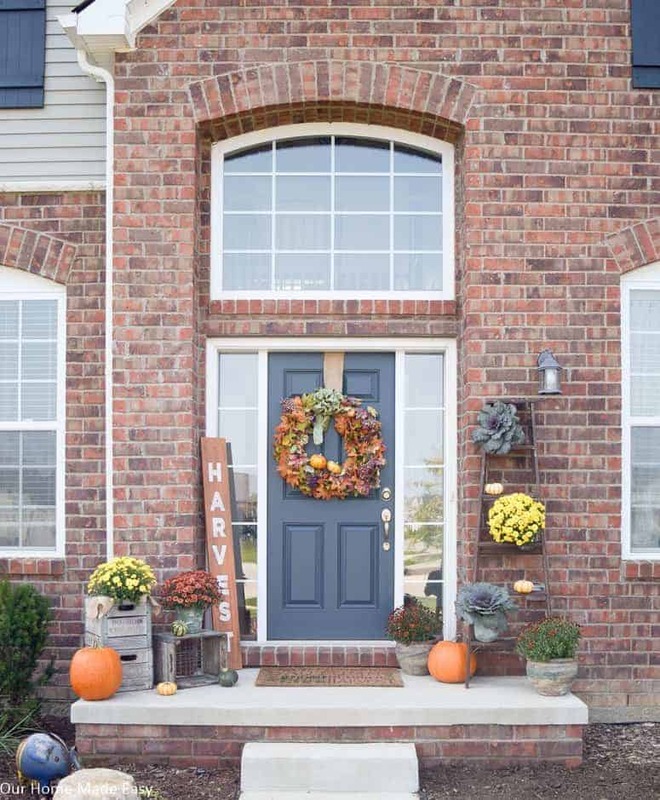 All year I wait for fall to make a reappearance, but I will admit that a change in decor, especially at the front door, is one of my favorite things! 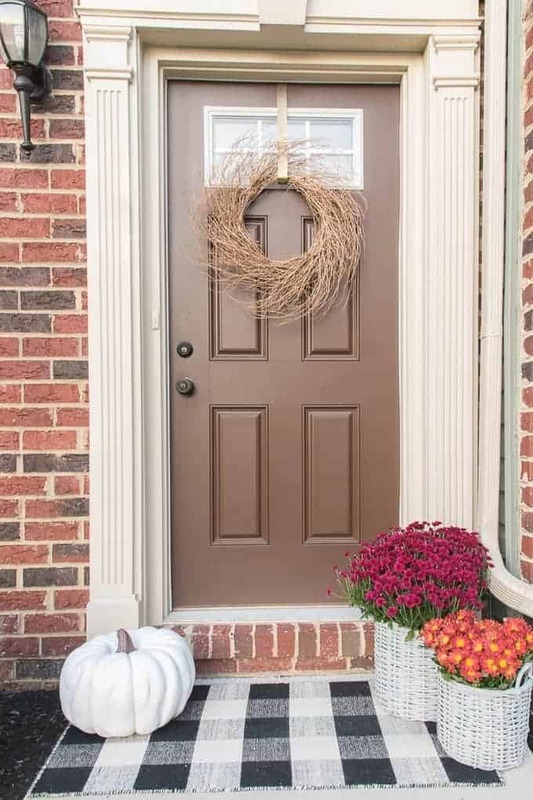 Decorating your front porch for fall is a fabulous way to ring in the season. The size of your front porch isn’t a barrier when decorating for fall. Right now we have a VERY small front stoop. In fact, it’s a stoop – it’s not a porch. Some people might even call it a landing. Still, that has never stopped me from going a little crazy once fall hits. If you see something as a barrier – it remains a barrier. Don’t fall into that trap. Embrace whatever it is that you have for space. Here’s what I did with my front porch. You’ll see that I used different sized mums in different colors, corn stalks and hay bales for height, and let the decor spill onto the front yard. Remove all that is summer. The first thing I do is store anything that has a summer feel. This includes the white lantern with teal candle, matching flower pots, and the doormat that sports all typically summer colors. Remember the rules of three. I follow this rule throughout my home as well as in outside spaces. To my eye, things that are too symmetrical are boring. Pick up three mums or other fall plant and either a: get them in three different sizes, or b: place them at different heights using upside down pots or the stairs. With this trick you’ll be able to see all of the different flowers, and the different heights are visually appealing to the eye. Use color to warm up the space. There are a couple of different ways to do this. My favorite is to indulge in using reds and oranges along with the corn stalks and hay. Another idea is to use the different “more vibrant” color mums like the blues and pinks. Lastly, pick one color and go for different tones of the same color. Any of these would be beautiful. Play on the bounty of the season. Bring on the pumpkins and scarecrows! Fall decor is just as abundant as it is during the holidays! I like to pile on the pumpkins, add a scarecrow or two, and use some sort of lighting to enhance the look in the evening. Fall is all about the bounty we have around us. Corn stalks, pumpkins, & squash, cabbages all celebrate the fall season. Let the decor spill past the porch. If at all possible, spill into the space in front of your porch. As you can see here, I continued the mums in front of the flowerbeds. What is in there isn’t at it’s peak, so it keeps all attention on the front door, where it should be. 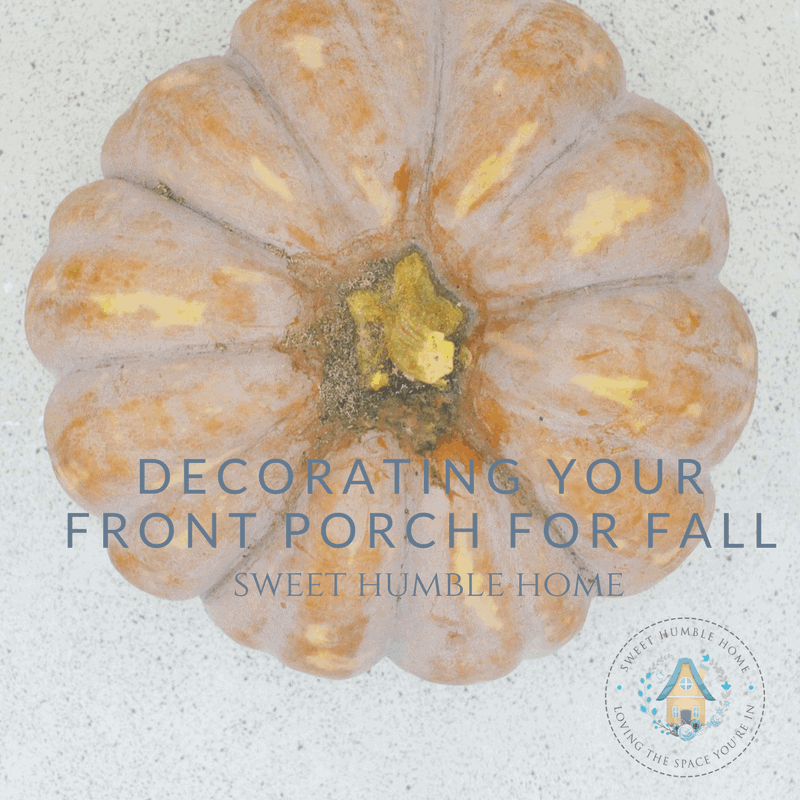 One of my favorite fall front porch’s is this one from Our Home Made Easy. I love the rustic look of it. It looks perfectly put together, and I’m a sucker for signs! That big, bright, beautiful wreath is a prefect compliment to the front porch! I enjoy Brittany’s blog because she has so many DIY projects with easy to follow steps. Not to mention – her home is gorgeous! You really should check it out! She had me at her doormat. I absolutely love it. She also teaches you how to make those beautiful lights she has on the side of her entryway. Talk about creative! Ashley is an interior designer, and her space is so inspirational. 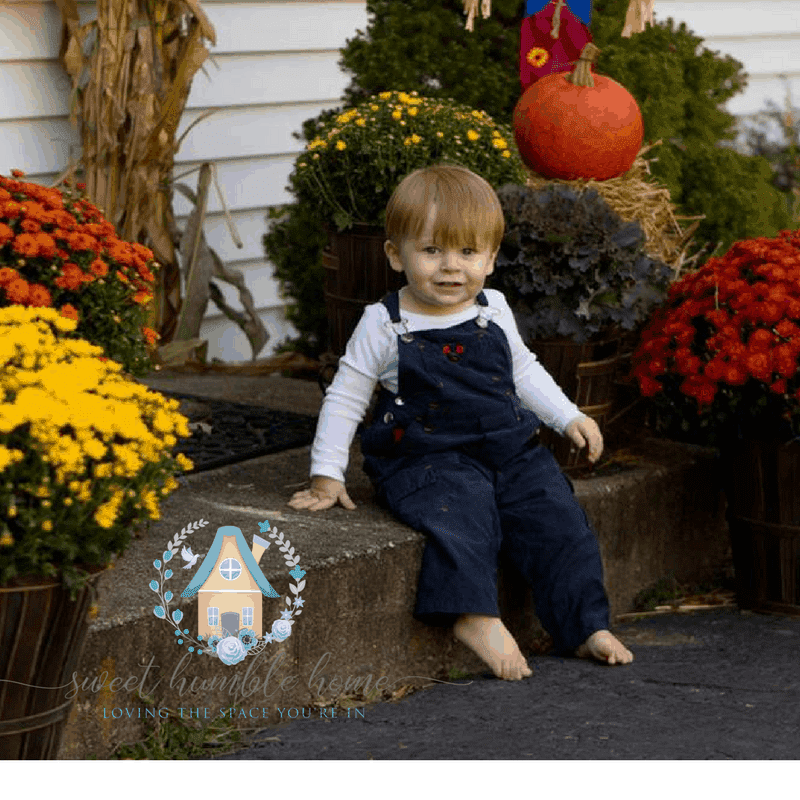 Take a look at her blog – and don’t miss her free Halloween printables! So cute! Stop it! At my house, I can’t put out real pumpkins because it becomes a daily fight with the squirrels. 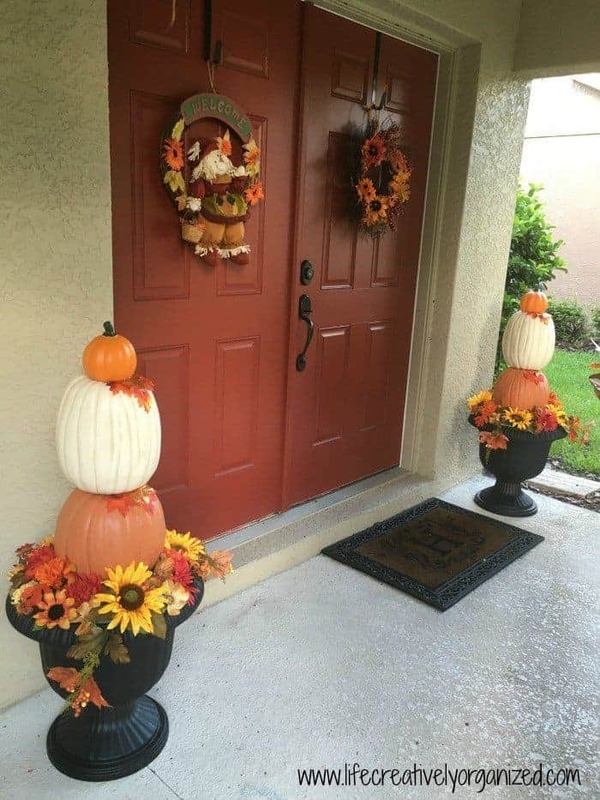 When I saw this post from Pam at Life, Creatively Organized I knew I had found a solution for adding more pumpkins to my front porch decor. She teaches you how to make these AMAZING pumpkin topiaries in her post. (I’ll absolutely be trying this)! Pam has a section of her blog dedicated to the holidays! Check it out – you won’t be disappointed! As soon as I saw Christene’s front porch decor I fell in love. It’s perfect, and it continues to prove the point that you don’t need a large space to make your front porch perfect. I’ll need to find out what color the paint on the front door is. Stunning. I love looking at Christene’s blog and everything she has done to her home. It’s beautiful. She posted photos from when she first purchased her home and follows them up with the changes she has made. I love it. I also love her “Gather” sign. She shares how she did it on her DIY Gather Wooden Sign post! I’m going to make that and add it to my seasonal sign collection! 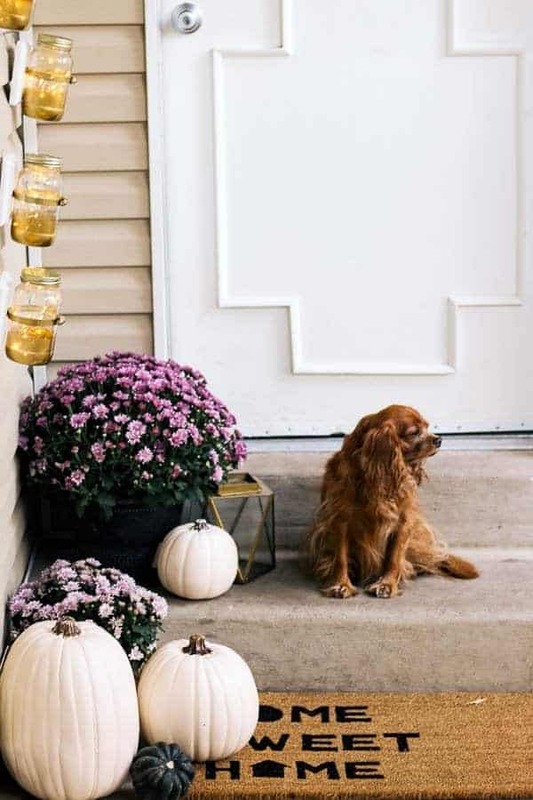 What are your favorite fall front porch decorating ideas? I’d love to hear them! Also, check out my post on Easy Slow Cooker Pot Roast for a fall meal favorite that friends and family ask me for time and time again!